To keep the teeth and gums clean so the teeth won’t rot and the gums won’t recede away (you’d want to keep your teeth clean for this reason whether or not you are having orthodontic treatment). Clean teeth and healthy gums will promote better tooth movement with a healthier result. It may sound absurd, but your body has only so much energy to spend on your mouth so when it is busy fighting decay and periodontal disease, tooth movement slows down considerably. You will notice that it is much harder to keep your teeth clean with braces. Food compacts in the brackets and between your teeth, and can only be removed by brushing and flossing. If plaque remains on the teeth for any length of time, it will leave a permanent white spot on the tooth. 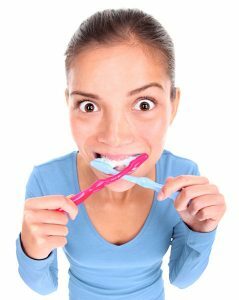 Brushing after meals should become part of your daily schedule. Use a soft toothbrush with medium pressure and brush at a 45-degree angle to the tooth; brush in small circles above and below the brackets. Completely clean each surface of every tooth in your mouth, including the areas above, below and between each brace. Each surface of every tooth should be brushed with 10 strokes of the toothbrush. This should take 2-3 minutes. Your toothbrush will wear out faster because of your braces, so be sure to replace it whenever the bristles start to fray, generally every 3 months. Dental floss is a nylon thread that is used to remove food particles and plaque from between the teeth. Flossing is more difficult when you have braces on your teeth. A floss threader may be needed to get the floss under the archwire. Use a piece of floss about 30cm long. Use the floss threader to get the floss under the wire. Slide the floss up and down along the tooth surface. Be very careful to not pull with too much force on your archwire. Flossing is important and should be done every day. The best time to floss is before bedtime after brushing to remove the plaque missed by brushing. This process will take more time than flossing without braces. If your gums are not healthy, they may bleed the first few days you floss. Remember that consistent brushing and flossing will result in a great smile! Interproximal brushes are also used to clean around brackets. ask your dental hygienist or therapist to show you how to use them. During orthodontic treatment your teeth are more at risk of getting tooth decay. Talk to our hygienist or therapist about ways of reducing the risk of tooth decay by using a flouride mouthrinse or tooth mousse.